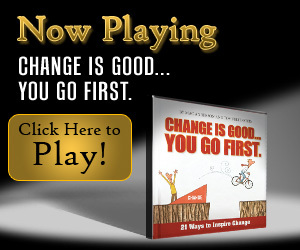 The Simple Truths website has lots of great inspirational content, but when I saw the title of the short (3-1/2 minute) video below, I laughed out loud, because it reminded me of the game my brothers used to try to play, “Let’s see who can hit the softest…you go first!” Of course you know how that went. I touched them just as softly as I possibly could, and they hit me hard and shouted, “You win!” It was a game I only played one time. On the serious side, however, the message of this movie cuts to the heart of one of our basic fears…Change. Intellectually, we know that lots of change is good, but emotionally, there is always some angst, some discomfort, some worry. Yes, even some fear! This movie was made for organization teams, so it addresses many of the situations AvoLead clients face. Its powerful and inspiring messages, however, can be applied not only to organizational change, but also to life change of any kind. Is there change going on in your life or work that you find unsettling? How are you dealing with it? Do any of this movie’s messages help you see change from a different perspective? Do you have any words of wisdom for others who are going through change in their organizations that is causing them fear or anxiety…or even functional paralysis? The movie content is also available in book form, and these books make great gifts or tools for a team-building event at your company, church, or nonprofit. Each book includes a free DVD of the movie. Guest post by Elizabeth H. Cottrell, RiverwoodWriter and Heartspoken.com. It was adapted from a post which originally appeared on her blog.